The Gorbals is an area in the city of Glasgow, Scotland, on the south bank of the River Clyde. By the late 19th century, it had become densely populated; rural migrants and immigrants were attracted by the new industries and employment opportunities of Glasgow. At its peak, during the 1930s, the wider Gorbals district (which includes the directly adjoined localities of Laurieston and Hutchesontown) had swollen in population to an estimated 90,000 residents. Along with its relatively small size, this gave the area a very high population density of around 40,000/km². Redevelopment post WWII has taken many turns, and the area`s population is substantially smaller today. In the early 2000s, a local heritage group started a campaign to reinstate the cross fountain, aided by people attracted to their Facebook page, Old Gorbals Pictures (Heritage Group). The group have discovered that a copy of the original cross fountain was installed on the Caribbean island of St Kitts & Nevis. They are working to engage professional help to digitally scan this object to allow for the manufacture of Gorbals Cross, No 3, to be installed in a new development near to where it originally stood. The name is first documented in the 15th and 16th centuries as 'Gorbaldis', and its etymology is unclear. It may be related to the Latin word garbale (sheaf), found in the Scots term garbal teind (tenth sheaf), a tithe of corn given to a parish rector. The taking of garbal teind was a right given to George Elphinstone in 1616 as part of his 19-year tack (lease). The placename would therefore mean "the Sheaves". The name is similar to a Lowland Scots word gorbal/gorbel/garbal/garbel (unfledged bird), perhaps a reference to lepers who were allowed to beg for alms in public. Gort a' bhaile (garden of the town) conforms with certain suggestions made by A.G. Callant in 1888, but other interpretations are also popular. The village of Gorbals, known once as Bridgend, being at the south end of the bridge over the Clyde towards Glasgow Cross, had been pastoral with some early trading and mining. The Industrial Revolution, thanks to the inventions of James Watt and others, stimulated major expansion of Glasgow. In 1846 the city absorbed Gorbals, with a population of some 3,000, and with cotton spinning and weaving factories, ironworks and engineering. Increasingly in the 19th and 20th centuries, the area became home to large numbers of migrants from the surrounding countryside, including the Scottish Highlands and rural Ireland, and immigrants from Italy, Eastern and Central Europe, to meet the needs of industrial capital. Govan parish was one of the oldest possessions of the church in the region. The merk land of "Brigend and Gorbaldis" is referred to in several sources. The village of Brigend was named after the bridge which Bishop William Rae had built in 1345 over the River Clyde; it lasted until the 19th century. Lady Marjorie Stewart of Lochow was said to have had a hospital built for lepers and dedicated to St Ninian in 1350, although this year is contested by current historians' estimates dating her life and activities. The lands on which the hospital was built were named St Ninian's Croft. They were later incorporated into Hutchesontown. Gorbals a view of part in 2006. After the Protestant Reformation, in 1579 the church granted the land for ground rents (feued the land) to Sir George Elphinstone, a merchant who was Provost of Glasgow (1600–1606). The barony and regality of the Gorbals was confirmed in 1606 by a charter of King James VI, which vested Elphinstone and his descendants. These powers descended to Sir Robert Douglas of Blackerstone, who in 1650 disponed (legally transferred) the Gorbals to Glasgow's magistrates for the benefit of the city, the Trades' House, and Hutchesons' Hospital. The magistrates from then on collected the rents and duties and divided them: one fourth to the city, one fourth to the Trades' House, and the remaining half to Hutchesons' Hospital. In 1790 the lands were divided into lots for development; the city acquired the old feus of Gorbals and Bridgend, and also the Kingston portion of the Barony of Gorbals. The Trades' House obtained a western section; and the remaining section lying to the east and south was allocated to Hutchesons' Hospital. The Hutcheson's Trust sub-feud a portion of their lands to an ambitious builder, James Laurie. (His grave, along with those of many other builders of Gorbals, is marked with well-carved masons' implements, indicating his Master status. The gravestones are visible at the Burial Ground, established in 1715 and now called the Gorbals Rose Garden). Laurie built the first house in St Ninian Street in 1794. The districts are now known as the Gorbals, Laurieston, Tradeston, Kingston and Hutchesontown. The Little Govan estate, including a small village of the same name, were replaced by the eastern parts of Hutchesontown and Oatlands. The Gorbals was a successful industrial suburb in the late 19th century, and attracted many Protestant and Catholic immigrants from Ireland, especially from Ulster (in particular from County Donegal), and Italy, as well as Jewish immigrants from the Russian Empire and Eastern Europe. At one time most of the Jews in Scotland resided in this area. Industrial decay and over-population overwhelmed the area, which became a centre of poverty in the early 20th century. Gorbals railway station opened on 1 September 1877. Changes in the area meant a decrease in business, and it closed to passengers permanently on 1 June 1928. In the 1870s, the City Improvement Trust cleared away the old Gorbals village and redeveloped the area to form the new Gorbals Cross, at the same time developing new workers' tenements around the former Oatlands Square. Much of the early Gorbals village was replaced by modern tenements in the street grid system being adopted in the city centre and notably in the south side including neighbouring Tradeston, Kinning Park and Hutchesontown. Along the riverside the classical terraces of Laurieston had taken shape. As with London and other major cities, in the post-war planning of the 1950s. 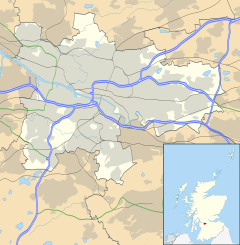 Glasgow Corporation decided to demolish many inner districts including Gorbals and Huchesontown, with families being dispersed to new outlying housing estates such as Castlemilk, in overspill agreements with New Towns such as East Kilbride, and others rehoused within the area but in huge concrete multi storey towers. In the late 1990s terraces of tenements in the modern style started to return and in the 21st century most of the concrete tower blocks have been demolished. Glasgow Corporation's replacement of old, outdated and crowded housing with new high-rise towers of social housing in the 1960s greatly improved conditions but had social consequences. Lack of awareness of the effects of concentrating families resulted in poor design, and the low-quality construction of the concrete, 20-storey flats led to innumerable social and health problems among the residents. Many of the blocks developed mould and structural problems. Their designs prevented residents from visually controlling their internal and external spaces, adding to issues of social dysfunction. The Queen Elizabeth Square flats, designed by Sir Basil Spence, was demolished in 1993 to make way for a new generation of housing development. In 2004, Glasgow Housing Association announced plans to demolish more of the decaying high-rise blocks, and to comprehensively refurbish and re-clad others. Two of the Area D blocks, as well as the entire Area E and Laurieston high-rise estates, were demolished between 2002 and 2016. The two surviving Area D blocks, and the entire Area B or "Riverside" estate, designed by Robert Matthew, will be the only high-rise flats left in the Gorbals. New housing has been developed at lower density, with design elements to encourage residents' and public safety. The Queen Elizabeth Square flats were demolished in 1993. Much of the area, particularly Hutchesontown, was comprehensively redeveloped for a third time, providing a mix of private (market rate) and social housing. Earlier phases of this recent redevelopment tended toward yellow-brick reinterpretations of traditional tenements, in a post-modern style. More recent phases, masterplanned by Piers Gough, have employed noted modern architects such as Page/Park, Elder & Cannon and CZWG, resulting in more bold and radical designs, accompanied by innovative street plans and high-quality landscaping. They incorporated many pieces of public art. The Gorbals Leisure Centre opened in January 2000, and the number of shopping facilities in the area is on the rise. In 2005, fire destroyed the Catholic Church of Blessed John Duns Scotus as a result of a fallen candle. The church was restored and reopened for worship in September 2010. With much of the Hutchesontown area of the Gorbals improved, the urban and social-regeneration program expanded into the neighbouring Laurieston area to the west. Since 1945, the Citizens Theatre has been based in the area at the former Royal Princess's Theatre, an historic Victorian building. The area also has a local newspaper Local News for Southsiders. The area is served by Bridge Street and West Street subway stations and numerous bus routes. A controversial pub in the district is the Brazen Head, located at the northern end of Cathcart Road. Formerly a railway pub known as the Granite City, it has been associated with Irish Republicanism. Nearby is the architectural masterpiece of the Caledonia Road Church, Category A-listed mid-Victorian structure of remaining walls and tower designed by Alexander "Greek" Thomson. A large selection of historical maps of the Gorbals is available from the National Library of Scotland. Ian Brady, (1938–2017; born in the Gorbals and named Ian Duncan Stewart); notable as the Moors murderer. Frank Bruno, the boxer, moved to the Gorbals to live with his partner in 2012. Sir Thomas Lipton (1848–1931), grocery mogul, founder of Lipton's Tea, and perennial contender for the sailing world's America's Cup. Benny Lynch (1913–1946), boxer, became the British, European and World Flyweight Champion. John Maclean (1879–1923), socialist politician; stood for election in the area in the 1918 general election. Hugh MacColl (1861–1915), footballer, founder and first captain of Spanish Sevilla F.C. in 1890; this is considered to be Spain's oldest football club solely devoted to association football. Michael McGurk (1958—2009), born here and moved to Australia, where he became a businessman; he was murdered outside his Sydney family home. Allan Pinkerton (1819–1884), born and raised here; he achieved fame in the United States by establishing Pinkerton's detective agency. Phil (b. 1937) and Derek Shulman (b. 1947), born here, these brothers became musicians; performed with the 1970s British progressive rock band Gentle Giant. The novel No Mean City (1935) is set in the Gorbals. The ballet Miracle in the Gorbals (1944), with choreography by Robert Helpmann and music by Arthur Bliss, is set there. Robert McLeish's play The Gorbals Story (1946) is set there. Originally produced by the Glasgow Unity Theatre, it was adapted as a 1950 film by the same name. Edwin Morgan set his poem "Glasgow Sonnet" in the Gorbals. "The Jeely Piece Song" – a children’s' street song expressed profound change in the area's way of life. A scene in the promotional documentary short The Frasers' Return (1962), directed by Harvey Harrison, was shot in Gorbals council housing. John Buchan's novel Huntingtower (1922) was adapted in 1978 as a popular BBC TV series of the same name, featuring the Gorbals Die-Hards. The setting was changed from Carrick in southwest Scotland to Glasgow. The novel Swing Hammer Swing! (1992) by Jeff Torrington, decades in the writing, is set in the Gorbals. The character Kristine Kochanski in the British TV series Red Dwarf grew up there. (1997). The television special Blackadder's Christmas Carol refers to the Gorbals in a scene in which Prince Albert (played by Jim Broadbent) claims to be Glaswegian. The BBC documentary Poor Kids (2011) tells the story of a 10-year-old girl living in a mouldy, high-rise council flat in the Gorbals. The high rise is demolished during the filming of the documentary. Top Chef Season 2 winner Ilan Hall named his first restaurant "The Gorbals" (in Los Angeles) after his immigrant Russian-Jewish father's neighbourhood in Glasgow. In Series 3 Episode 5 of the BBC series The Thick of It, the main character Malcolm Tucker is called the "Gorbals Goebbels". ^ "Land Area (based on 2011 Data Zones)". Statistics.gov.scot. Retrieved 11 November 2017. ^ "Population Estimates (Current Geographic Boundaries)". Statistics.gov.scot. Retrieved 11 November 2017. ^ "A Gorbals Tour, Glasgow". GlasgowPunter.Blogspot.co.uk. Retrieved 12 July 2017. ^ Digital, Innovation. "Laurieston Local development strategy: Urban regeneration in Glasgow City Centre". ClydeWaterfront.com. Retrieved 12 July 2017. ^ "Caledonia Road United Presbyterian Church (Former), 1, Caledonia Road, Gorbals - Buildings at Risk Register". Buildingsatrisk.org.uk. Retrieved 11 November 2017. ^ "Find by place - Map images - National Library of Scotland". maps.NLS.uk. Retrieved 12 July 2017. ^ "Glasgow gangster turned writer Jimmy Boyle: 'I would be dead now without books'". The Guardian. 20 May 2016. Retrieved 24 January 2017. ^ Smith, Steve; Crooks, Lauren (6 May 2012). "Boxing legend Frank Bruno stuns neighbours after moving into Glasgow flat". Daily Record. Scottish Daily Record and Sunday Mail. Retrieved 11 May 2012. ^ Mott, By Sue. "The Doc - still in rudest of health". Telegraph.co.uk. Retrieved 24 January 2017. ^ Forbes, Peter (30 August 2002). "Winning lines". The Guardian. Retrieved 24 January 2017. ^ Harvey, Ellie; Carson, Vanda (8 September 2009). "From a Glasgow slum to Sydney's north shore". The Sydney Morning Herald. Fairfax Media. Retrieved 22 December 2010. ^ "Review: 'The Gorbals Story'", New York Times; accessed 14 February 2016. ^ ""The Jeely Piece Song"". FortuneCity.co.uk. Archived from the original on 10 March 2012. Retrieved 12 July 2017. ^ "Who", Thegorbalsla.com; accessed 14 February 2016. Wikimedia Commons has media related to Gorbals.